It shows one of the 26 sectors TESS will observe over the next two years. Back in May, one of the cameras on NASA's Transiting Exoplanet Survey Satellite (TESS) snapped a two-second test exposure to make sure that it works. It was but a taste of what we can expect from Kepler's successor, though, and now we finally know what its cameras are capable of. 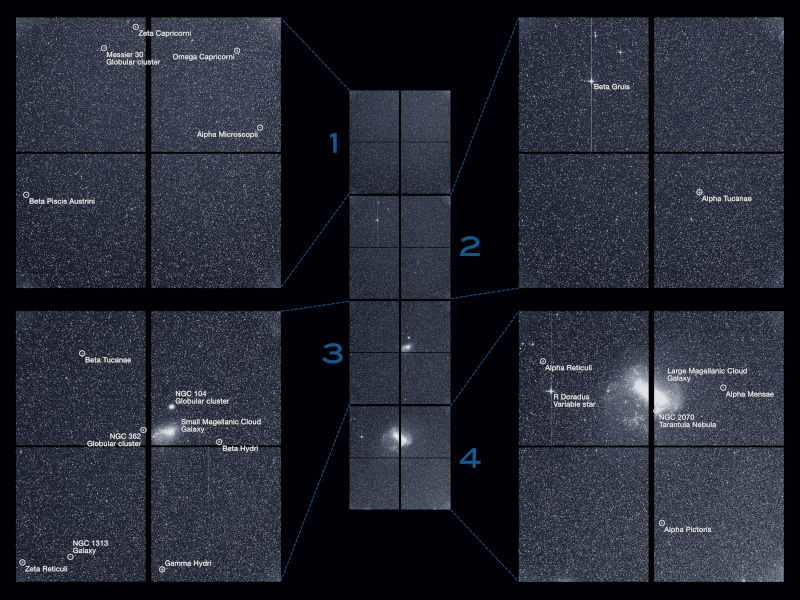 The planet-hunting spacecraft's four cameras have taken their "first light" image -- the first astronomical photo after a telescope has been assembled -- showing the satellite's full field of view. The whole photo, which TESS captured during a 30-minute period on August 7th, shows a dozen constellations. It also features the Small and Large Magellanic clouds, two irregular dwarf galaxies orbiting the Milky Way. Above the Small Magellanic Cloud is a globular cluster, while the immensely bright star to the galaxies' left is the red giant Mira variable star R Doradus. However, the truly important parts of the image for the TESS team are all the stars that potentially serve as home to previously unknown planets. According to TESS principal investigator George Ricker: "This swath of the sky's southern hemisphere includes more than a dozen stars we know have transiting planets based on previous studies from ground observatories." The James Webb Telescope (that is, when it launches) and various ground-based telescopes will then use spectroscopy to measure the light passing through the atmosphere of the new planets TESS finds to learn more about them. NASA expects to figure out their atmospheric compositions, masses and densities using spectroscopic techniques. This "first light" image represents one of the 26 sectors TESS will monitor over the next two years. The spacecraft will observe one sector for 27 days each, with the first half making up the southern sky taking place during its first year.